The folks at the Department of Nutrition and Food Science at the University of Maryland have recently made an important discovery about some healing foods. These foods are special, because they contain extra doses of disease-fighting antioxidants and healing phytonutrients. They’re called “microgreens” and are the seedlings of vegetables and herbs. Not familiar with microgreens? They have been slowly gaining popularity as a new culinary trend over the past few years. 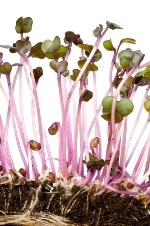 Although small in size, microgreens can provide surprisingly intense flavors, vivid colors, and crisp textures. They are often served as an edible garnish or a salad ingredient. Until recently, however, no scientific data were currently available on the nutritional content of microgreens. The present study was conducted to determine the concentrations of ascorbic acid, carotenoids, phylloquinone, and tocopherols in 25 commercially available microgreens. The U.S. researchers found that different microgreens provided extremely varying amounts of vitamins and carotenoids. Total ascorbic acid contents, for example, ranged from 20.4 to147.0 milligrams per 100 grams fresh weight, while beta-carotene, lutein/zeaxanthin, and violaxanthin concentrations ranged from 0.6 to 10.1, respectively. Meanwhile, alpha-tocopherol and gamma-tocopherol ranged from 4.9 to 87.4. Among the 25 microgreens researched, red cabbage, cilantro, garnet amaranth, and green daikon radish had the highest concentrations of ascorbic acids, carotenoids, phylloquinone, and tocopherols, respectively. In comparison with nutritional concentrations in mature leaves, the microgreen leaves possessed higher nutritional densities. So what can all of these nutrients do for you? Ascorbic acid is a naturally occurring compound with antioxidant properties. Carotenoids could help protect you from the damaging effects of free radicals. Tocopherols are vitamin-E compounds that are fat-soluble. Like ascorbic acid, they are potent antioxidants that could protect against diseases like cancer. And, finally, phylloquinone, also known as vitamin K, plays an important role in maintaining your health, vitality, and well-being when included as part of your diet. Microgreens can now be found at many grocery stores, but if you’re having trouble locating some, head over to your local health-food store and pick some up for your next meal.